The Chapstick Cherry Kiss arrived in a tonally matched wrap scrap storage bag with the PinkNova logo. This is a beautiful touch and I love it when the retailers find a use for their scraps. Out of the bag it was the colors that struck me first. The cherry chapstick color is made of two threads, one pink and one purple to give the wrap the vibrant pink color. The kisses are raised from the warp and give an embossed feel. The wrap itself was stiff in it’s loom state, exactly as I would expect with the high linen content. While linen takes some work to get whipped into wrapping state, it is an easy care fiber which makes for an excellent trade. I tandem wear the twins daily and at least once a day, we take a nice long walk in our wraps. In the arid desert you find that it is never the extra weight that will get you, it’s the extra body heat. When I am wearing a single baby and chasing my independent near two year old, I am usually wearing her sister in a three layer back carry. I prefer the support and reinforcement of the three layers and find the double hammock is my go to even when wearing one baby. With the extra body heat and extra layers, the last thing you want is a thick wrap to insulate all that heat. Chapstick Kiss is wide enough for a successful ruck and supportive enough for a wiggly toddler. In multi-layered back carries the grip of the kisses hugs and holds tight. As this wrap wears in, the grip becomes more manageable, allowing smoother passes and a bit more slide. What I truly loved is the high linen content which made this wrap incredible for breathability. The double hammock is a three layer back carry and adding tandem wearing on top of temperatures in excess of 90F and you usually end with a sweat. We wore the PinkNova release at the zoo for four hours and the light breeze was felt through the wrap. Linen is worth the time and energy to break in, it makes a great supportive wrap, superior breathe ability, and the right blend for any weather. I give the same advice for all loom state or fairly new wraps. Wash, steam iron, wear, and repeat. Manipulating the fibers is really the only way to get a coarse fiber like linen or even hemp to become a soft cushy wrap. All wraps come with initial care instructions to set the weave, even machine woven wraps can have a loose weave that is set by the fibers swelling in the presence of warm water. I choose to air fluff dry my wraps and a linen wrap benefits from being fluff dried with a freshly washed towel. Although there isn’t any heat, the moist towel humidifies the cool air being pumped into the dryer and this, in turn, allows the fibers to swell and soften. Following the fluff to dry, I always steam iron my cotton blend wraps. Linen can withstand high heat and high steam so I use both and a spray bottle of water. This is another swell and soften step that will tremendously help the fibers to become more pliable. The only caveat to all the care I list above is for silk and wool. These fibers are an entirely different care mechanism and I do not use the method above for either silk or wool. 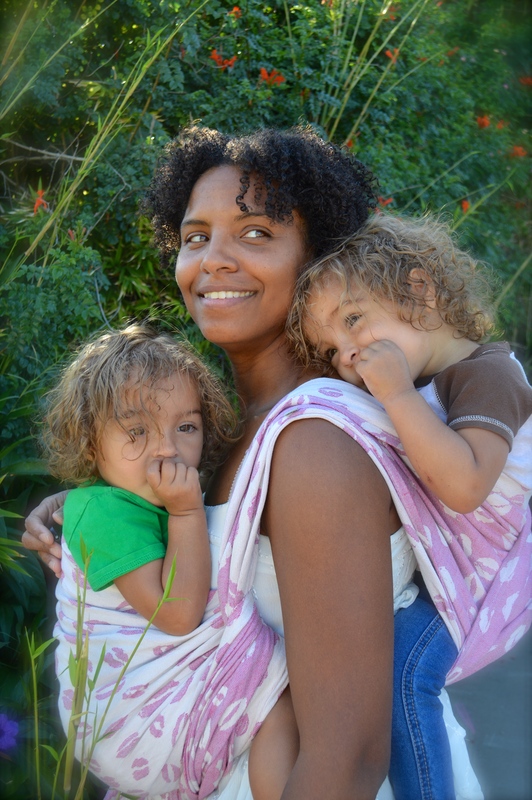 With two wiggly toddlers who love to bounce as I walk, I always look for my wraps to have superior support. I pulled out all the stops testing Cherry Chapstick Kiss. 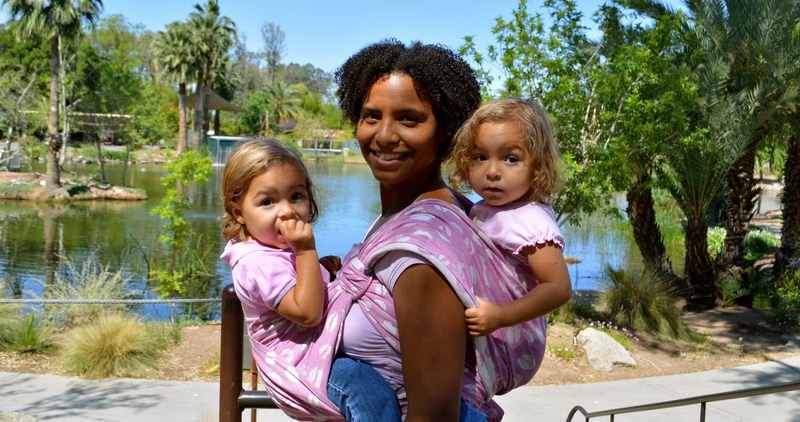 Symmetrical Half Jordan’s back carry and Double Rebozo front carry. Double Hammock, double rings with Front Cross carry. Back Wrap Cross Carry. We even managed a back Torso Carry as well as a Double Rebozo Shoulder to Shoulder. In all these carries I found nothing but support. I found this wrap to be completely ruckworthy and even as a single layer back carry, my little beasties were no match for the width and support of this wrap. My wraps have to be able to work. I am not a fan of a wrap that requires alot of care. While linen wrinkles easily and this wrap will always require a steam iron to really allow the kisses to shine through, it is still an easy care wrap. I was not afraid to wrap in the grocery store parking lot or even at the park in the grass. She cleans easily and the extra wash only helps to soothe the tense fibers and soften her up. I always reinforce my back carries and often choose three layer carries. The linen is balanced with cotton, two natural fibers known for high air flow. 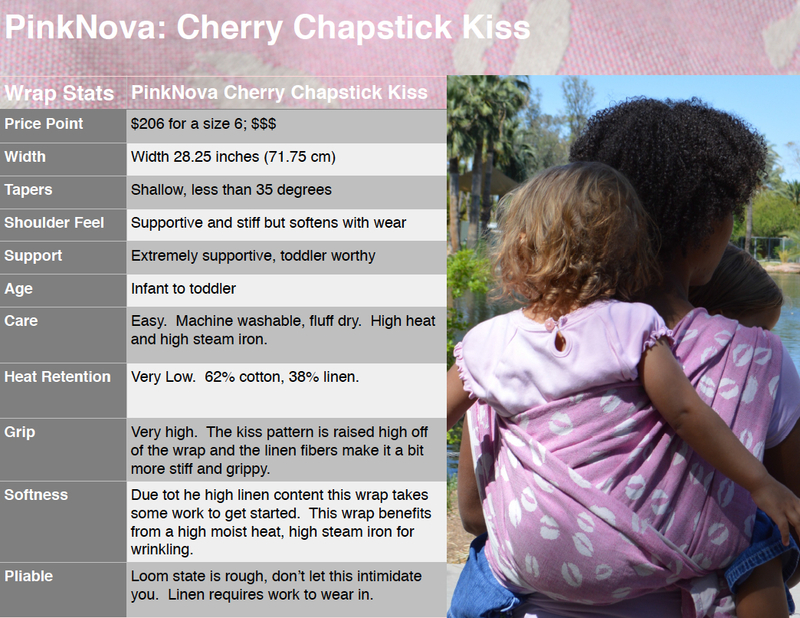 I enjoyed our time with Cherry Chapstick Kiss and look forward to what Pink Nova has in store next. Previous Previous post: Chocolate Bloomies: Chocolate+Zucchini=Delicious!